The APMA Seal of Acceptance is granted to footwear, insoles, hosiery, materials, and equipment that allow for normal foot function and promote quality foot health. A listing of products that have been awarded the APMA’s Seal within the last 6 months. A listing of running, walking, toning, training, and softball footwear awarded the APMA’s Seal of Acceptance. 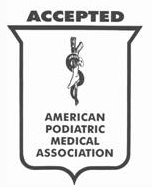 A listing of foot products for infants, toddlers, and youth awarded the APMA’s Seal of Acceptance. A listing of products made specifically for people with diabetes. A listing of flip flops and sandals awarded the APMA’s Seal of Acceptance. Running-related products that have been awarded the Seal of Acceptance and Seal of Approval. A list of suggested products to prepare your feet for the spring. A listing of occupational footwear awarded the APMA’s Seal of Acceptance. Dr.Frisch gives advice to WebMd.com about reducing foot pain. Foot pain isn’t normal, and yet people put up with it,” says Dennis Frisch, DPM, a podiatrist in Boca Raton, Fla., and an APMA spokesman. About 35% of those who reported heel pain in the survey, for instance, said they had it for two years or longer. There are some age-related changes in our feet that can make pain more likely. But painful feet aren’t inevitable with age, Frisch says. If you follow six simple steps — some obvious, others often overlooked — chances are good you’ll sail through life with comfortable, pain-free feet.